Stoneflies are any of the species of insects belonging to the taxonomic order Plecoptera. There are 1718 identified species in 239 genera.The name comes from the Greek plec meaning folded and ptera meaning wing. They are known as "stoneflies" because they rest on stones. They are soft bodied varied sized hemimetabolous insects.. They belong to the infraclass Neoptera, which share the trait of folding their wings over their backs while at rest. Their wings develop in external wingpads which is a characteristic that sets them in the division of Exopterygota. North American stoneflies are mainly divided into two groups which are Euholognatha and Systellognatha that differ based on mouth part morphology and feeding biology. The taxonomy is not well known because of the larvae not been associated with adults.All species produce aquatic larva, and most of them live only in cool waters, usually running streams. The adult stonefly live a short life. They have difference in texture between the hind and the fore wings. They have weak mouth parts,small coxa,and two long cerci. But they are known as poor filers. Stoneflies are easily distributed into few simple characteristic. They are flattened , soft-bodied animals that can grow up to 100mm. They have 2 pairs of membranous wings, manible mouthparts, 2 cerci at tip of abdomen, and usually have long legs. 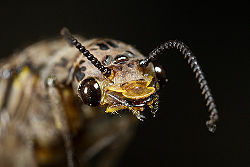 Also they have threadlike antennae and consist of two compound eyes with three simple eyes. Because stoneflies are not a strong fliers they do not stay far from the streams they lived in as a nymph. Stoneflies consist of many different families but most of them are usually small and dull- colored with a dark tip at the end of the wings. The scientific name Plecoptera means folded wings which represents the fanlike wings that are tucked against the abdomen under the forewings. The forewings are usually large and longer than the body. There are a pair of tail-like appendages on the abdomen that are not recognized because of the long forewings that cover them up..
Stoneflies have an incomplete metamorphic cycle which consists of eggs, nymphs, and adults. The stage nymph can be taken from few months to one full year with many species and developing about 2 or 3 years. Nymph's usually go through 12 to 25 molts before developing in to a adult stage. This is often called the instar stage where they shed their exoskeleton. Depending on the families, nymph sizes could be varied. Fully grown nymphs crawl along the stream or lake bottom to climb out of the water's edge to complete their life cycle as an adult. Females return to the water after the early evening time. Mostly common egg deposition is done by flying over the water and dipping their abdomen to release eggs. Then clusters of eggs releasing into the water is repeated multiple times before the female goes back to their land. 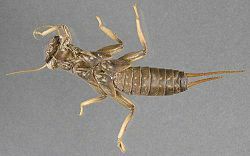 The adult plecoptera are poor fliers which makes them easier meal target for cruising trout. Usually emerging at night, males tend to grow faster and emerge faster then females . After their nymph stage the stonefly is left with one instar. The adult stage for stoneflies is very short, usually lasting for a few days or up to a few weeks. The ones that live only for a short amount of time never eats but only focus on mating. The ones that live longer will eat pollen and plants..
Stoneflies have a unique way of reproduction, the male and female usually find each other near rivers or streams. Males and females go through a complex signals in mating which known as drumming. The drumming signals are only attractive to the same species of stonefly. They drum typically by tapping, rubbing, and scraping their abdomens on a object like a rock or log. The male signals his desire to mate by beating the ground with the tip of his abdomen. Some other species tip back and forth or do pushups to attract each other. Usually the male drum as they search for females and the female drums back. Both of them communicate continually until they mate. Most females only mate once but males will attempt to mate multiple times.During the mating male transfers the sperm to the female's reproductive organs, the eggs are in pellets or masses with multiple eggs. Mating happens on the ground or on vegetation.The female drops her egg in the water by dipping her abdomen in the water and the eggs hatch within three to four days. The eggs of the stoneflies have a gelatinous coating that absorbs the moisture, which helps some of the eggs to survive in water that dries up periodically. ↑ 3.0 3.1 Order Plecoptera. chebucto. Web. July 26, 2006 . ↑ 4.0 4.1 4.2 4.3 Ramel, Golden.The Stone flies Earthlife. web. November 7 2011 accessed. ↑ Nelson, Riley.PlecopteraTree Life of Web Project. web.Jan 1996. 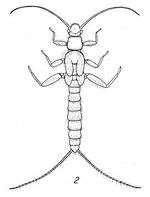 ↑ 6.0 6.1 .Plecoptera:stonefliesento-csiro. web. November 6 2011 accessed .Author unknow . ↑ Hadley, Debbie.Stoneflies,Order PlecopteraAbout.com. web.November 6 2011 accessed . ↑ Bryan, Nora.Stonefliestalkaboutwildlife. web.November 6 2011 accessed . ↑ Chan, Brian.PlecopteraFlyfisherRepublic. web.November 6 2011 accessed. ↑ Coventry, Andrea.The Life Cycle of the Stonefly. eHow. web. Accessed November 6, 2011 . ↑ Plecoptera (stoneflies)Mdfrc. web.November 7 2011 accessed Author unknown. ↑ 12.0 12.1 12.2 Stonefliesanimals.jrank. web. Accessed November 20, 2011 . Author unknown. ↑ 13.0 13.1 13.2 Plecoptera - stoneflies Bumblebee.org.web. Accessed November 22, 2011. Author unknown. This page was last modified on 28 July 2014, at 22:48.